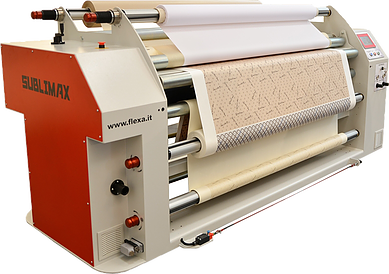 Sublimax is a Heat Press (oil heated) for dye-sublimation, roll-to-roll mode. The roll-to-roll mode allows a higher printing definition than printing directly on fabric, starting from any image already printed on roll-sublimation paper. The roll-to-roll mode is suitable for high production. Sublimax also offers to fix images already printed on fabric through a process called “Reactivation”. This mode allows you to fix colours already printed on fabric by using different technologies. The printed pigments are fixed at high temperature giving a uniform result and vibrant colours.